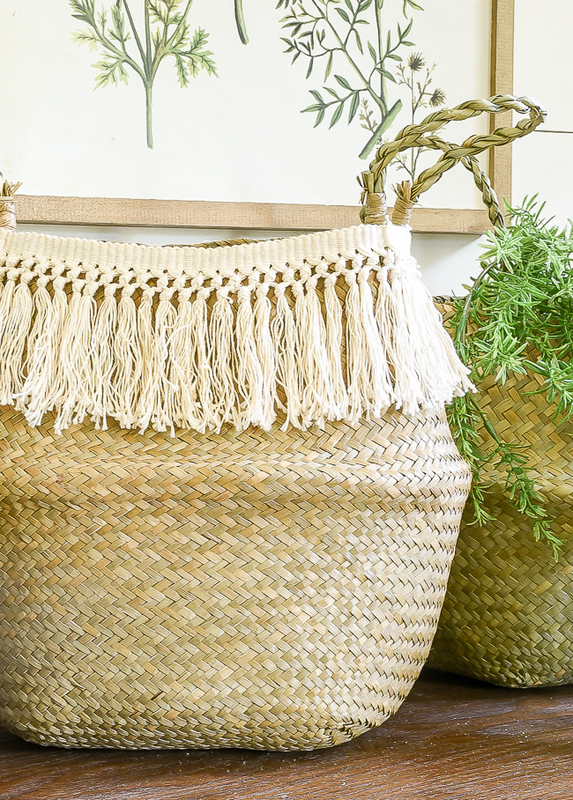 Belly baskets are the perfect versatile home decor accessory that can be bought cheap and easily and inexpensively updated to fit your style. 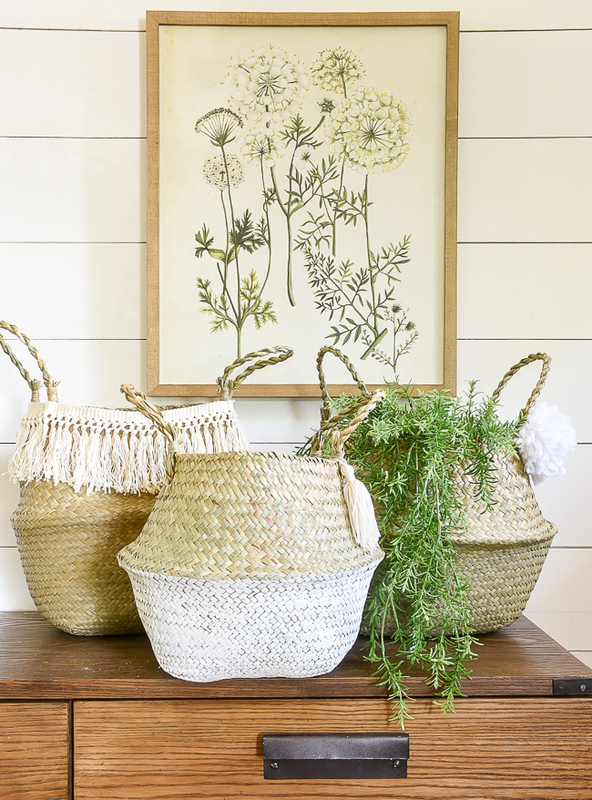 A few months ago, I wrote about my favorite home decor staples and included baskets because they are versatile and perfect for just about any space. Belly baskets are especially great since they are collapsible, affordable, easy to update and great to use for storage or as planters. 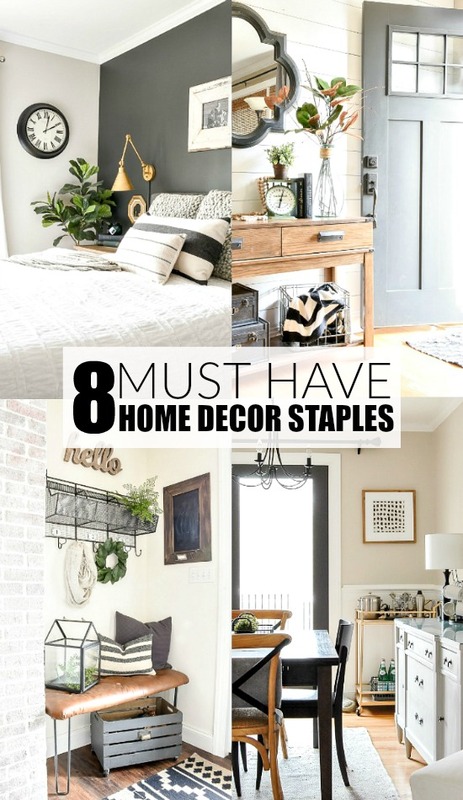 I recently bought a few to take to the shop and thought I would share some easy and affordable ways to give them a little personality. 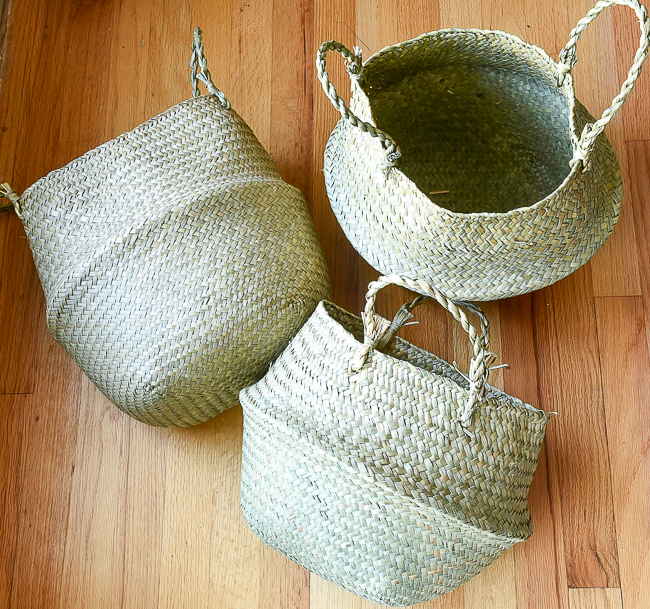 I bought my baskets from eBay, but you can also find affordable ones in places like HomeGoods, T.J.Maxx and Marshalls. 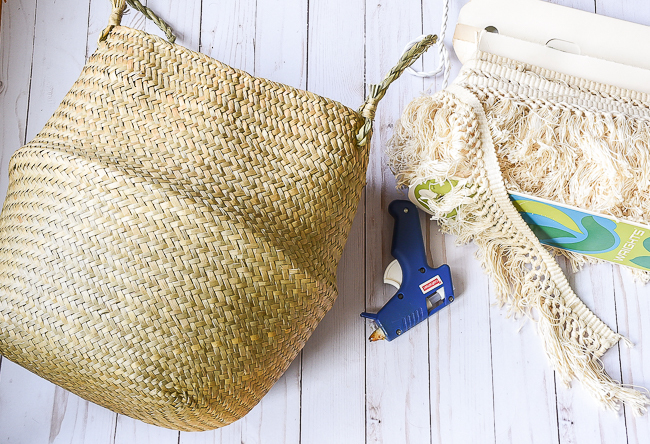 Adding a bit of color to belly baskets is super easy with paint. 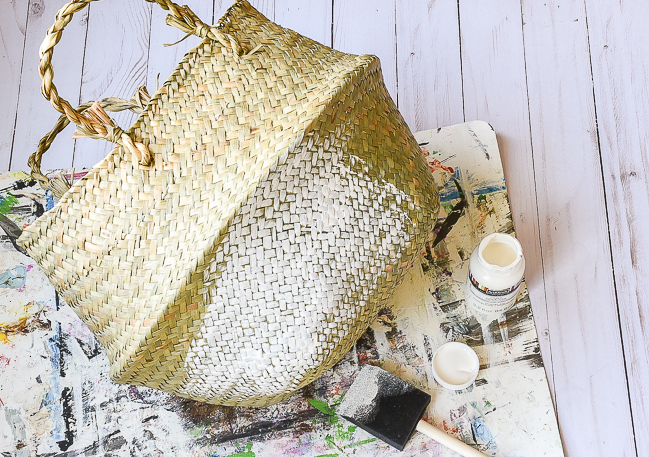 I used an inexpensive foam brush to apply a light coat of white chalk paint to the bottom half of my basket. To avoid the paint from seeping through the cracks I used more of a dry brush technique. 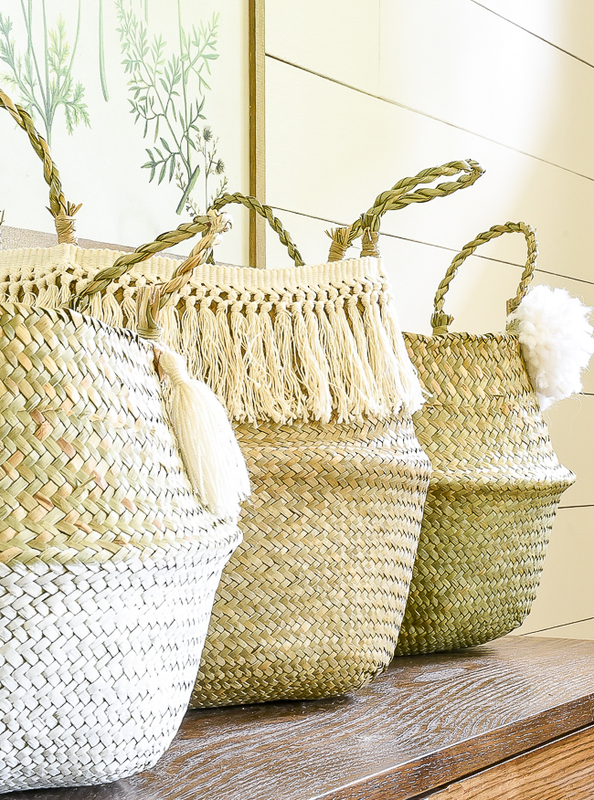 Adding fun tassel trim can instantly add style to these otherwise basic baskets. I was lucky enough to find some pretty amazing tassel trim from a local church yard sale. I'm thinking it's pretty old because the price on it says, $0.73/yd and I'm fairly certain tassel hasn't been that cheap for many many years. I added the trim around the top of one of the baskets securing it with hot glue. 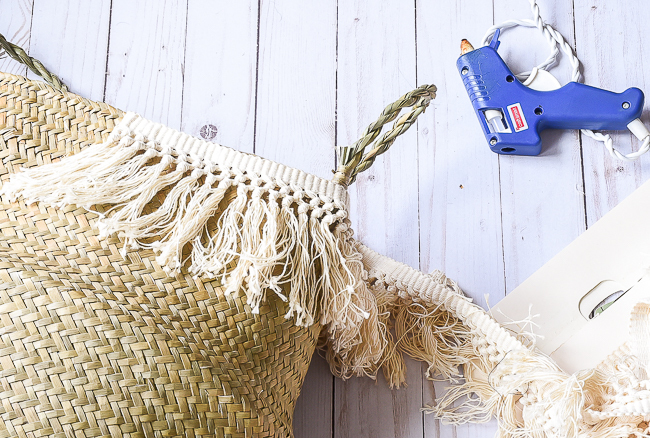 To create a clean finish, I attached one end of the trim to the top of the basket then folded it over continuing to glue around the entire brim of the basket. When I got to the end, I cut the trim about a 1/4 inch longer then needed, folded the cut end under, secured the threads with hot glue then glued the trim to the basket. This created a nice clean finish and you can barely tell where I joined the ends of the trim. Who doesn't love pom poms? 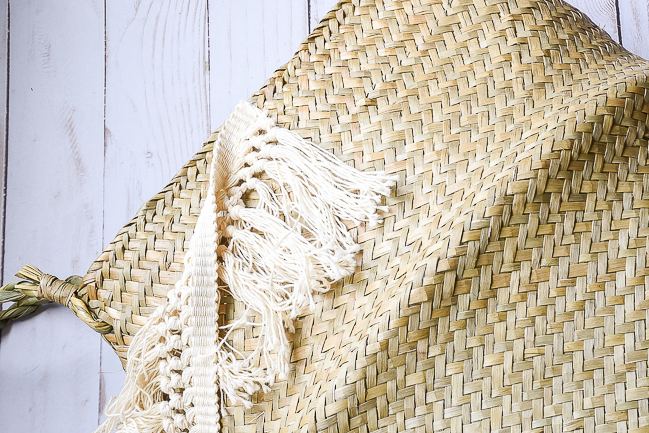 Go neutral or add a bit of bohemian flair with a mix of fun bright colors. Whatever you decide, they are an easy way to add a bit of whimsy to your belly baskets. I used a scrap piece of cardboard and made a quick little template for my pom poms. 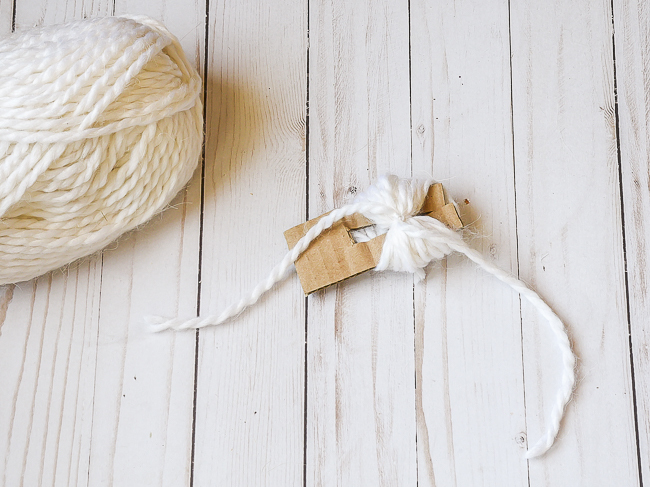 I simply wrapped some yarn around the template (the more yarn the better! 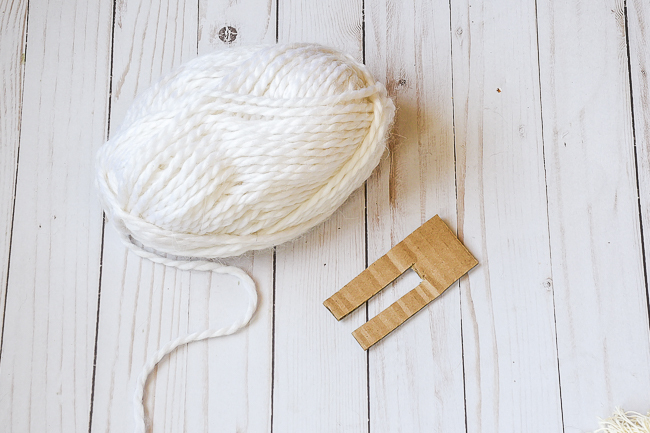 ), slipped a piece of yarn through the cut-out, pulled tight, secured it with a couple knots then cut the opposite ends of yarn. 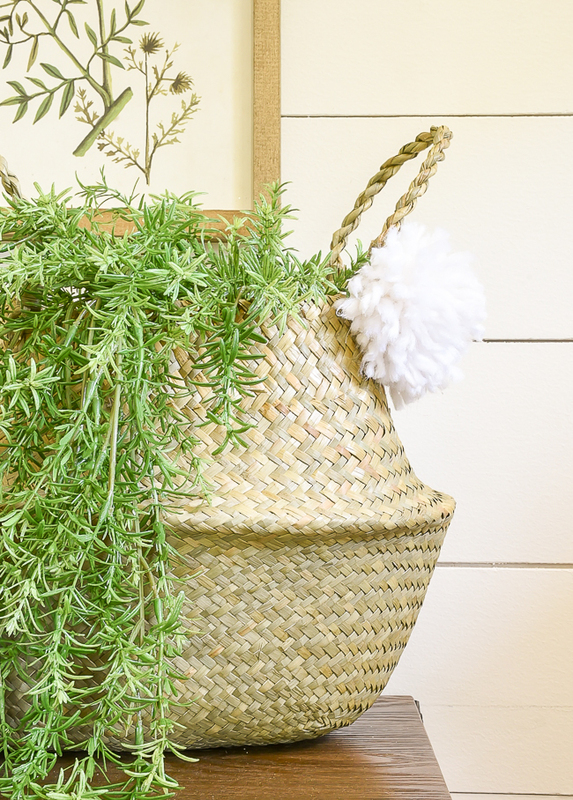 I just added one pom pom near the handle of my basket, but have fun with them and add as many as you'd like. 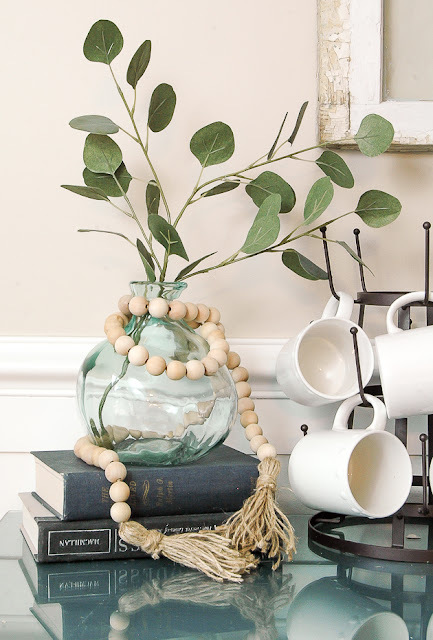 Just like pom poms, tassels are easy to make and the color possibilities and combinations are endless. 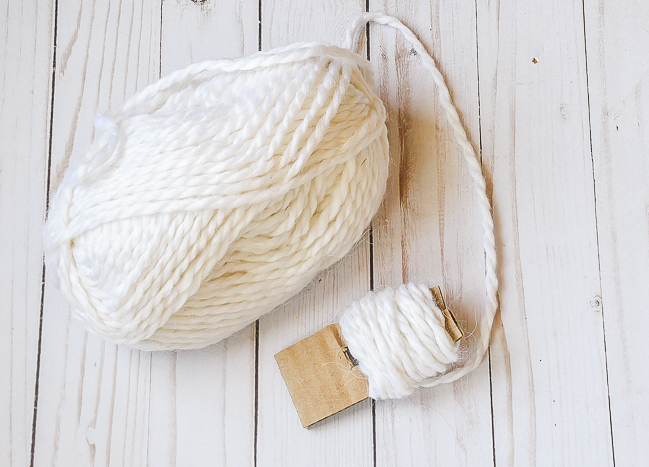 I made a simple off-white tassel (see how I make them HERE) and tied it up near the handle of the basket. 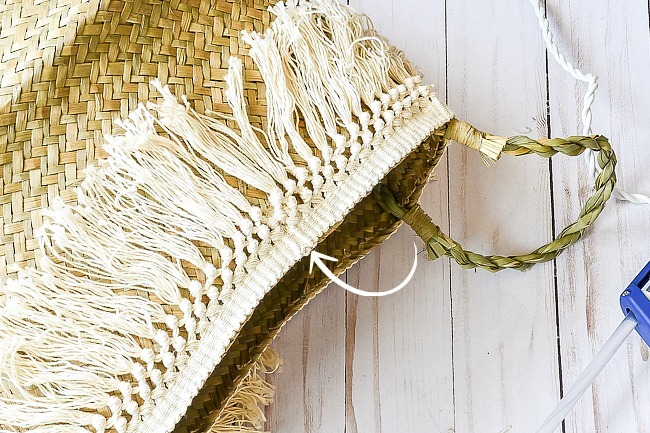 The best part about these inexpensive belly basket decorating tips is that you can mix and match ideas to create endless combinations. 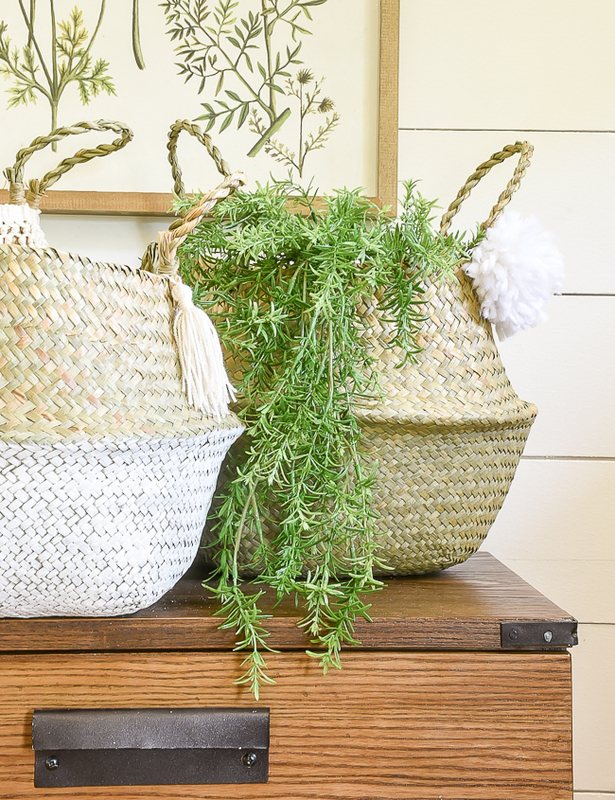 Couple that with the multiple uses of these versatile baskets and you have the perfect affordable home decor staple.